PATONG: Sompetch Moosopon, President of the Patong Entertainment Association, today said that owners of Patong entertainment venues will “take action” if their request for an extension to closing times is not granted. “If our request for Patong to be designated a special entertainment area – which will be proposed to Interior Minister Bhokin Bhalakula and Deputy Interior Minister Pracha Maleenont – is denied, we will take action,” he told the Gazette. K. Sompetch explained that Mayor Pian is expecting to meet the ministers, possibly today or early next week. “We have asked them to consider Patong as a special zone. Any entertainment venue in Patong should not have the same closing time as other places in Thailand. The closing time we have asked for is 4 am,” he said. “We will hold discussions about whether to protest if the government ignores our request. The Phuket City Entertainment Business Association [PCEBA] will be invited to join the discussions. The PCEBA has already accepted the 2 am closing time,” he added. The earlier closing time of 1 am – or 2 am in the case of a small number of venues – is not the only problem troubling entertainment business owners this year. On March 12, all existing entertainment licenses were revoked and new licences introduced. However, the government has yet to set the fees for each of the new licenses, and fears are rife within Phuket’s entertainment industry that each license may cost as much as 50,000 baht. 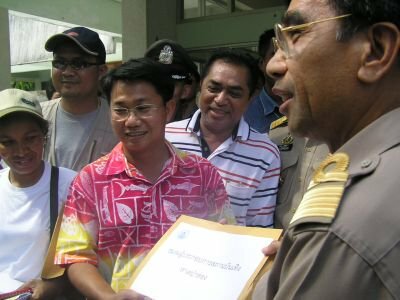 Wisut Romin, Deputy Secretary of the Phuket Provincial Administration Office (PPAO), today told the Gazette, “The Department of Local Administration is still working on the rules for calculating the fees. We do not want to see the big venues have an advantage over the smaller ones.